Shawnee Mission Kansas, IMR Legendary Powders is clarifying recent misconceptions about TRAIL BOSS gunpowder. TRAIL BOSS is a 100% SMOKELESS propellant. 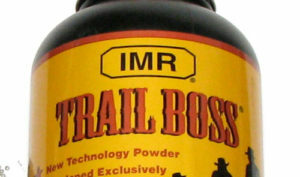 Various articles and blogs have appeared miss-stating that TRAIL BOSS is a blackpowder/muzzleloading type propellant. Nothing could be farther from the truth. Since TRAIL BOSS is smokeless it does not require any special cleaning like muzzleloading powders. Using TRAIL BOSS, or any smokeless powder, in a muzzleloading firearm is never recommended. The primary advantage of TRAIL BOSS is that even in reduced, low velocity loads such as those popular with Cowboy Action shooting the powder fills the shell case. This not only improves the ballistic uniformity of the load but is an added safety feature for the handloader because an accidental double charge spills over the shell case. Always follow IMR’s loading recommendations exactly as shown in the 2011 Basic Smokeless Manual, Annual Manual and in the RELOADING DATA CENTER at imrpowder.com. For more information on further loading information, contact IMR Powder Company, 6231 Robinson, Shawnee Mission, KS 66202, Phone: 913-362-9455; E-mail: help@ihodgdon.com. I’ve used TB a lot. It is dirty but fairly easy to cleanup and I DO NOT use water.